You can control the contents of snippets in the search results – filter the text of headers or add video and image icons which are available on the found pages. 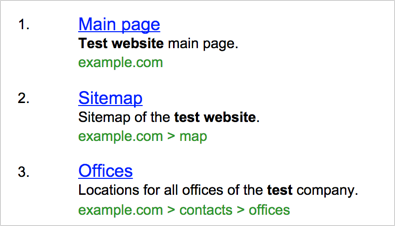 To do this, select the required search on the page and go to the Snippets. Yandex.Site Search can paste video and images from the found pages into the snippets (this is not yet possible with SaaS-search technology). If there is both a video and an image on the page, and you have checked both boxes, Yandex.Site Search must select one of them for the snippet. 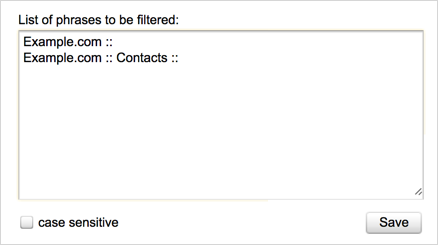 You can select your preference from the list which appears when both boxes are checked. In the List of filtered phrases form you can indicate repeating fragments which are to be cut out of the headers (one phrase per line). Note. Spaces at the beginning and end of the lines are read when searching for matches. For the above snippets you can select the following filtering phrases “example.com : " and "example.com :: help section::”. 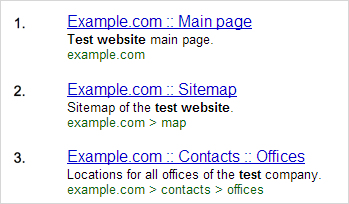 Yandex.Site Search cuts the specified phrases from the snippets titles. Only one phrase (the longest one) is cut from each title.